Welcome to Rocky’s Gold, a gold-mining themed slot that’s simply oresome. This fun, colourful game is inspired by popular TV shows like Gold rush and Gold Divers, based on the idea that no matter who or where you are, everyone wants to strike gold! Northern Lights takes this relatable theme and turns it into a cartoon slot featuring 3 favourite bonus games with a slight twist. In Northern Light’s first ever slot, Rocky is a hard-working miner who spends his days digging away, picking away on the hunt for golden game nuggets. You’ll be joining Rocky on his mining adventures on this 5-reel, 3-row game with 20 fixed paylines. Rocky’s Gold is a medium volatility game with an excellent RTP rate of 96.46%. Get ready for some mine-blowing bonus games and prizes, not to mention lots of fun and entertainment! Bets for Rocky’s Gold range from a minimum of € 0.2 to a much larger, maximum bet amount of € 100. On your adventure with Rocky the miner, you’ll see red, blue, and green ores and 4 low value playing card symbols. The wild symbol is a gold title, and it substitutes all of the symbols except for the bonus treasure chest symbol and the Rocky’s Gold (RG) symbol. On any spin, Rocky might appear and trigger the bonus for you. He’s a cheeky guy, though, and might appear near the reels just to walk off again! If he does appear and stay on the screen, however, Rocky will rummage around for dynamite explosive to throw onto the reels. Wherever they land, they’ll leave behind wilds. There are 3 different dynamites that Rocky can throw: a single dynamite, multiple dynamites, or a huge stick of dynamite that leaves behind multiple wilds. When he stops throwing dynamites, the feature ends and you’ll be left with some big bonus wins! The TNT bonus game is triggered when you get 2 interlocking symbols which appear only on reels 3 and 4. When you get a TNT box along with the detonation box, Rocky will eagerly detonate his plunger which will select a lower value symbol to explode into a higher value symbol. Rocky may stop there or detonate again, selecting the next lowest symbol and doing the same with it. The round ends when Rocky ends up blowing himself and the TNT symbol up. The Pay Dirt bonus feature can either lead to a Pick Me Bonus round or to the free spins round. If you get just 2 treasure chest bonus symbols, you trigger the Pick Me Bonus and all you have to do is pick a treasure chest to reveal either a cash prize or to start the paydirt bonus with 5 free spins. 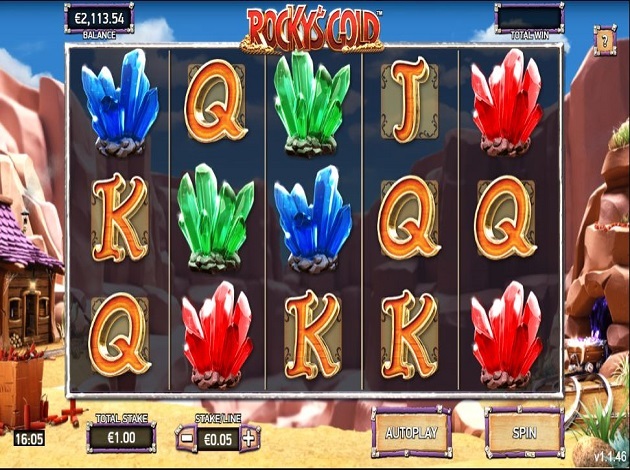 To active the Pay Dirt free spins, you need a minimum of 3 scatter symbols, which will earn you 10 free spins. For 4 scatters you get 15 free spins while 5 scatters get you 20 free spins! Rocky has just one more surprise up his sleeve! On any spin during the Pay Dirt bonus, you can also be awarded with reel modifiers as well. These can be fully wild reels, multipliers, or locked modifiers. If you get a locked multiplier, it will apply to either the fully wild reel, the multiplier modifier, or both. The value of each symbol will depend on your bet size, but regardless of your stake, the Rocky’s Gold symbol comes with the highest payout. The wild symbol and the red precious ore are also very high paying symbols. The medium value symbols are the blue and green rocks, while the playing card symbols come with the lowest prizes. All symbols except for the Rocky’s Gold symbol require a minimum of 3 matching symbols on a payline to earn a prize. Rocky’s Gold is bright, colourful, and fun to look at. The happy soundtrack makes it a really cheerful game, but what really completes it is the constantly animated Rocky. He’s always doing something near or on the reels, so he’ll always keep you entertained! There’s also a remastered 80’s classic soundtrack which some players might recognise! If you want to sit back and enjoy the action, you can choose the autoplay option for a number of spins, setting a mandatory loss limit. The game panel consists of a few icons in a wooden style: at the top, you’ll find a wooden question mark symbol which will take you to the paytable. At the bottom, you can adjust your bet easily by using the – and + buttons, and that’s it! We think this game really speaks for itself, there’s nothing not to like in Rocky’s Gold! With lots of features and action, you best be prepared for lots of explosions, TNT action, and dynamites as well. Rocky loves blowing things up, so you better cover your ears, this guy is full of surprises!